Bonetown refers to a neighborhood just west of Flemington, near the Hunterdon County Library complex on Route 12. It got its name through legend of a chicken stealing family that once lived there who, when forced to move, left great piles of chicken bones at the site. Today, the houses in Bonetown are sizeable and the yards immaculate, not a bone in sight. If it weren't for the sign that says so, no one would ever think that chicken stealers once lived there. There is, however, further evidence of chickens in Flemington's past. Another sign at the north end of town remembers the Flemington Egg Auction, the country's first, and, at one time, the largest, cooperative egg auction, which operated at Park Avenue and Corcoran Street from 1932 until the death of the egg business in the 1960s. Twenty more historical markers scattered throughout Flemington point to interesting architecture and homes of past prominent citizens, commemorate wars and their heroes, remember the age of railroads, or remind us of the town's important place in the chronicle of craftsmanship in America. No doubt you've notice a similar sign somewhere in your town, or along a local road, pointing out an interesting place, or a situation that once was. For a little state, New Jersey has a big history, loads of towns, and lots of markers. 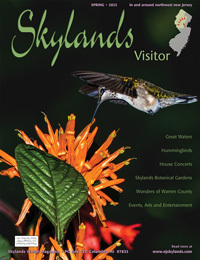 There are somewhere around 1,200 historical markers in New Jersey, 500 of them in the Northwest Skylands region. Most likely there are many more, because these are only the markers so far recorded at the on-line Historical Marker Database , a remarkable resource that documents over 22,000 historical markers around the world, but mostly in the U.S.. Volunteer editors at the Web site evaluate input from nearly 1,000 volunteer contributing correspondents who send pictures, transcriptions, descriptions and precise locations for historical markers around the country. The result is a Web page for each marker, as well as helpful mapping and statistical functions. Markers are sorted by location, subject, and date. For instance, 6,961 markers make the Civil War the most marked category. And Virginia contains the most markers in the nation with 4,169. Readers quickly learn that the second-oldest marker in the country, dating back to 1797, is at The Penitentiary House in Trenton. Three New Jersey counties rank among the fifteen counties in America with the most historic markers. Bergen is number thirteen, Mercer is eleven and Hunterdon County is ninth. 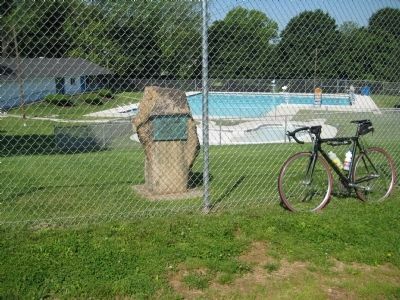 Most of Hunterdon's 215 historical markers logged at the Historical Marker Database have been submitted by retired engineer and avid bicyclist, Alan Edelson. In all, he has photographed and documented over 300 places from his bicycle seat, and all within the past year (although Bonetown's is not one). "I started taking pictures for Google Earth and I began to notice the markers. Somehow I stumbled on the database, and it got addictive; kind of like a treasure hunt," explains Alan. 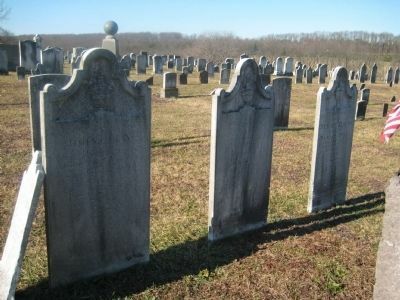 He spotted signs on weekly bike rides with the Western Jersey Wheelmen, the Morris Area Freewheelers , or while driving: churches, cemeteries, lime kilns, quarries, bridges, taverns, and unusual places. He got lists from larger organizations responsible for markers, like county heritage commissions, historical organizations like the Daughters of the American Revolution, township committees or park systems. Then he returned on his bike to each place with his camera in his back pocket, checking them off, one by one. "It's a good excuse to go for a ride. I think I'm almost done," he says. The editors at HMdb want a close-up shot of each sign, and at least one other of its location. They check each submission and accept based on the site's merit. Sometimes they can elaborate. "I sent in one about the 'Spirit of the American Doughboy' at the Frenchtown Elementary School. Turns out it was kind of standard issue; there are several hundred of them across the country. It's probably the most seen statue in America besides the Statue of Liberty. People just don't realize it because they're all over the place." The Maine is remembered at the community pool in Washington. Edelson’s bike stands by. Edelson tracks any sign within range of his bike, a perimeter that extends well beyond the Hunterdon County borders. Another HMdb correspondent named Bill Couglin, who ranks second on the all time list with 2,082 markers, has documented most of the territory north of Route 80. Alan has posted many of the sites in Warren County, all the way up to the Old Mill in Blairstown. They memorialize early settlers, Revolutionary patriots, grand railroad trestles and tunnels, historic forges and furnaces, and the Morris Canal. Warren hosts some "standard issue" as well. Facing away from the community pool in Washington, behind a chain-link fence sits a memorial to the U.S.S. Maine , sunk in Havana harbor in 1898. The plaque is one of hundreds cast from the metal recovered from the ship. Markers show the way to Daniel Bray’s grave. To the south, Alan found the marker for Province Line Road in Skillman (Mercer County), erected in 1971 by The Society of Colonial Wars in the State of New Jersey to explain the division between East and West Jersey dating to the dealings of Lord Berkley and Sir George Carteret in the late 1600s. And when Alan's curiosity was piqued by the name of the Daniel Bray Highway (Route 29) between Frenchtown and Stockton, he tracked down the nearby gravesite and the marker of the man "who with a few patriotic citizens braved the enemy and collected enough boats from along the river to make possible the memorable crossing of the ice-laden Delaware of General Washington and his troops on the night of December 25, 1776." Edelson found still another road in Asbury, where Route 173 is marked for a more contemporary historical fact: the introduction of the Jersey Barrier . 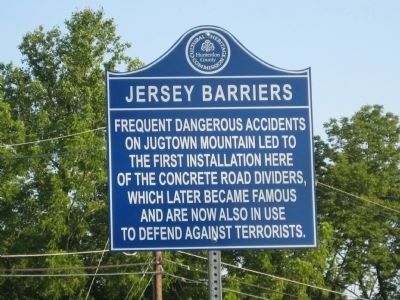 The Hunterdon Heritage Commission sign states: "Frequent dangerous accidents on Jugtown Mountain led to the first installation here of the concrete road dividers, which later became famous and are now also in use to defend against terrorists." Jersey Barriers are common on the interstate, but are no longer in use on Jugtown Mountain. Alan added his own embellishment when he spotted and photographed some abandoned barriers on the side of the road. Could they be remainders of the original barriers? When Alan noticed that one of our area's most renown monuments was not listed in the HM database, that for World War II Congressional Medal of Honor winner John Basilone, he took his bike on a special trip to Raritan. "One sign led to another," he remembers. Within a couple of blocks were markers peeling back the layers of history within the durable Somerset County town along the river: the Naraticong Indians, the Raritan Water Power Canal, and the Nevius Street Bridge. Monuments to war veterans come from all eras and in all sizes. TheBranchburg Veterans Memorial covers six of them at once. 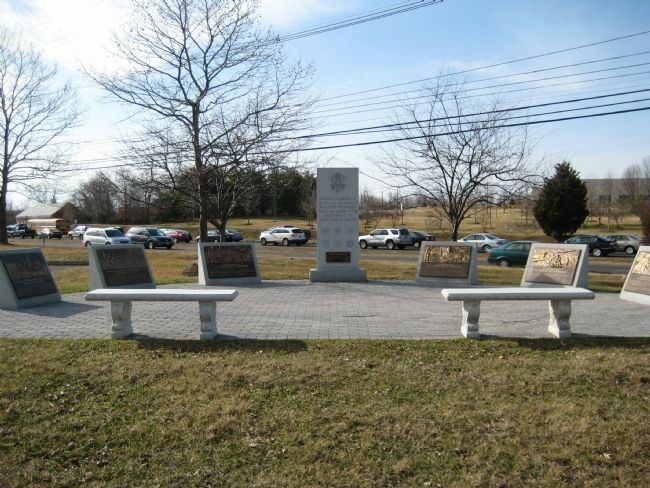 Dedicated in November of 2000, markers about the American Revolution, Civil War, Word Wars I and II, the Korean War and Vietnam, all with art depicting each conflict, surround a small court and a central monument honoring the men and women of Branchburg who proudly served. In Flemington there is a marker that you can't see from the road in memory of "Vietnam War Dogs and Their Handlers." It lists nine New Jersey military dog handlers who were killed in action, along with a poem called "The Soldier Dog," written by Vietnam veteran Joe Ferrara and etched on a donated black slab with funds raised by students at the Middle School where the memorial resides. The Lambertville 8-12 Baseball League erected a memorial to PFC Charles L. Danberry who gave his life serving in the Marine Corp in Vietnam. A block or so away, the graves of Revolutionary War Lieutenant, George Coryell and "one of Gen. Washington's spies," Sam Holcombe, have been marked by the Hunterdon Cultural and Heritage Commission. There are dozens of memorials to those that died in the attacks of September 11, 2001. Among the most elaborate is theTower of Remembrance at The Shrine of Saint Joseph in Stirling which combines steel from the North Tower Building of the World Trade Center and bells from the Missionary Servants of the Most Holy Trinity's Seminary in Monroe, Virginia. The name of each innocent victim who died at the World Trade Center, the Pentagon, and in the field in Pennsylvania is inscribed on the memorial walls. 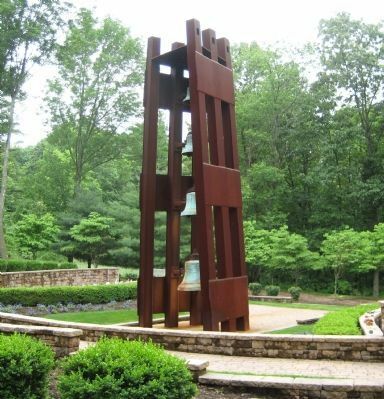 A bell tolls forty-six minutes after each hour starting at 8:46 am and ending at 8:46 pm It tolls four times in remembrance of the lives lost at the North Tower, at the South Tower, at the Pentagon, and in the field in Pennsylvania. No less heartfelt is a bronze plaque mounted on a boulder at the athletic fields at Woodfern Elementary School. Erected by Ernie Guaimano as an Eagle Scout project, the inscription reads simply "Hillsborough Will Never Forget." 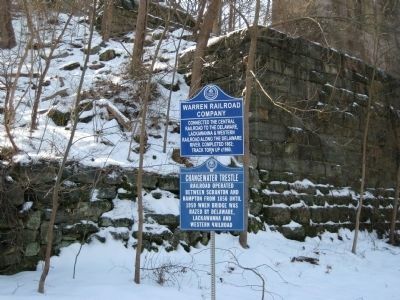 The abutments at Changewater carried the railroad trestile across the Musconetcong river, between Hunterdon and Warren counties. Historical markers describe New Jersey's history in a way no text book can. Prehistory and natural phenomena are not ignored, from the low lands at Bog Meadows , Moggy Hollow and the Great Swamp to the rugged landscape of the Kittatinny Ridge at High Point. Beyond the prominent installations at the Morristown National Historical Park and at other famous encampments, a long and winding trail of markers completes the story of the Crossroads of the American Revolution: taverns where plans were made and troops recruited, homes that hosted both patriot and loyalist leaders, cemeteries filled with soldier's tombstones, and the site where former soldier Shepard Kollock began to print the New Jersey Journal in 1779 "to maintain the cause of freedom. "The tale of Mines, Metal and Men, the "other" revolution of industry and transportation, is told at dozens of rail crossings, canal locks, quarries, forges and furnaces. Early pioneers, homesteads, farms, kilns and mills relate the roots of early settlement and agriculture. And the intricacies of a society and culture that spans three-hundred years shout from markers for the earliest churches to the Clinton Music Hall , Lambertville Music Circus , and modern dance pioneer Ruth St. Denis' first performance at Somerset Hall. Now that Alan is nearing the end of his HMdb involvement, he's taken to mounting a video camera on his bike helmet. Look for his work on a YouTube channel near you. Meanwhile, log onto theHistorical Marker Database, see what's still missing, and fill in the blanks!